Fox Mulder returns to me this January 24th, after having been on a secret assignment and unable to contact me since 2002. In honor of our reunion I shall recap one of his greatest adventures each day until we are together once more. Oh, and that Scully woman will be there too, but she’ll never understand him like I do. Let me start by saying that I am fascinated by science. I barely understand it, but it thrills me. For the horror fans, Firewalker has little tentacly creatures that incubate inside humans, then explode out of their throats. For the sci-fi lovers and geeks, the tentacly thing is ultimately determined by Mulder and Scully to be a silicon-based life form, a parasitic fungus that infests its host via spores. This rocks for two reasons. First, there is that interplay between Mulder and Scully that we all loved. Their chemistry was like the anti-Moonlighting of sexual tension; rather than flirty one-liners, it was intellectual bantering, total geek foreplay. So, when Mulder brings up the possibility of a silicon based life form, Scully is skeptical as ever, but when given an opportunity to examine a corpse killed by the fungus, she ultimately concludes that Mulder is correct. Science meets the supernatural. It’s like honey on peanut butter. Sadly, the episode ends with the formulaic but enjoyably infuriating disappearance and cover-up of all the evidence the duo has discovered over the course of the show. 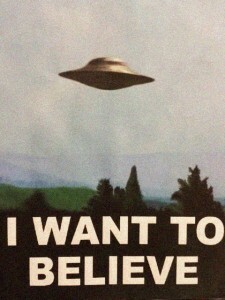 And Mulder is once again left with his dreams and his poster. Second reason this episode rocks: A SILICON BASED LIFE FORM!!! I don’t really know if this is actually a viable concept but it’s a cool idea so Go Science! Okay, I know Spock found one “first” but since his show takes place in the future, technically it’s Mulder FTW! Showing us humans we don’t know everything we think we do…. The X-Files 6-episode series returns on January 24, 2016 on the Fox network. I have three lovely but exhausting girls. I stay home with them and draw comics and such. Aside from being a momma, I'm an expert insomniac, lover of all things dark and creepy, and hopeful initiate into the Evil League of Evil.